Not to be confused with Cheeseburger Pizza these are Pizza Burgers. Low carb and cheesy, with vegetables too, this burger has it all. 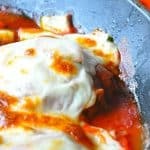 A quick and easy dinner everyone will enjoy. Hello darling, where have you been hiding all my dinner making life? Today was a busy little day and at the end of it I got to make dinner too. Excitement. But then as I was pondering my choices: frozen hamburger patties, frozen chicken, half a zucchini, a few limp beets and some tomato sauce this triumphant idea floated into my head and whispered Pizza Burgers. TRUE STORY. Anyway my choices were limited so I went with it. Everyone was happy, everyone ate and no one cried, I call that a win in my book. Check out the pizza burgers if you need a quick delicious meal that can be pretty darn healthy too. Pinning! Great idea, looks fabulous! I have always lived by the old adage, "Eat and shut up, or shut up and eat." In this case, I doubt you had to tell anyone to eat, because they were too busy stuffing their faces!